On the surface, the Brazilian presidential election seems complex. Despite the coup and Lula´s arrest, the PT seems to be the favorite in the week before the election, facing a fearsome creature of the dictatorship - Bolsonaro. What is in dispute in this election? Who is the candidate for large capital? What is the strategy of the bourgeoisie? And the answer from the left? I will now address these issues. For the Brazilian bourgeoisie, the economy is not in dispute in the elections: whoever wins will confront the problems of neoliberalism with more neoliberalism. Whether through the utopian way of an "inclusive neoliberalism" preached by the PT, or by the ultraneoliberalism of the Toucans (PSDB) or Bolsonaro. What the bourgeoisie contests is the political form to manage Brazilian crises. What will be the face of the institutional, legal and cultural arrangement that will replace the New Republic, definitively condemned. On the immediate plane, there are two paths. In his own words, Lula offers credibility and stability. The credibility of which he speaks is not with those from above, but with those from below: what Lula says, society will accept. In other words, Lulaism offers its capacity for persuasion and popular neutralization, as a path for order. If Dilma Rousseff was the shadow of Lula, Fernando Haddad is projected as the avatar of this policy. At the opposite, complementary pole, is Bolsonaro. How to understand him? Bolsonaro is the frightening response of a frightened society. Those who are out of work are afraid of hunger, and those who work are afraid of unemployment. Everyone is afraid of violence, and also afraid of the police. In a context where collective forms of struggle are discredited, Bolsonaro promises order through truculence like Trump in the United States, Erdogan in Turkey, Modi in India, Uribe in Colombia or fascism in Italy - all currently in power. Therefore, Bolsonaro is not alone: he is a tendency, not an aberration. In synthesis, these are different ways to manage the colossal Brazilian crisis: the PT offers stability through conversation, while Bolsonaro proposes the same through physical violence. Seeing the impossibility of Alckmin, Meirelles or Amoedo, which of these routes is preferable to capital? If Haddad wins, he will have dificuldades in governing. The dilemma of power will be how to deal with the snake of anti-PTism. How to persuade those who embarked on the impeachment and Lula's imprisonment, to accept that all this leads to Haddad? A Bolsonaro win will be a problem for the governed. His base among the powerful is fragile, his rejection rate is high and his character unpredictable. The question is: who will discipline the disciplinarian? Haddad and Bolsonaro are provisional and necessarily unstable responses of a bourgeoisie in a phase of reorganization. Beyond the immediate, the bourgeois trend is moving toward Bolsonaro. For the end of the new Republic also compromises the Toucans. This is what explains the New Party - as "new" in politics as it is “democratic,” the DEM party. It expresses a bourgeoisie intuition that new times demand new answers: it is a Bolsonaro that has not yet come out of the closet. Because what the ruling class is incubating is a Bolsonaroism without Bolsonaro. In France, the fascist Marine le Pen complains of those who came together to defeat her in the second round. Why, after all, says a discontented Le Pen, did they elect someone who implements her policies, but without making noise. Beneath the dust of the next elections, the Brazilian bourgeoisie forges its Macron. The intersection of Bolsonaro and Amoedo may be João Dória. Between the collapse of Lulaism, configured in the rebellion of June of 2013 and a reliable Bolsonaroism, that is in the oven, the Brazilian bourgeoisie updates itself. This rearrangement is expressed in the dispersion of candidates. As in 1989, when the New Republic began, the bourgeoisie is looking for a way, but now to bury it. In the meantime, there is speculation on the best band-aid to stop the bleeding unleashed by the coup. Rationally, it seems Ciro Gomes: the anti-PTism would feel contemplated as well as the “not him” movement would breathe a sigh of relief. But the snakes unleashed by the coup defy reason. Any government that comes will necessarily be unstable - as was Collor. In this context, the Toucans are self-critical: it would have been better to let Dilma bleed, than to conspire for the coup and compose a government with Temer. They were overanxious for power, and now they are condemned to patience. The bourgeoisie and the Toucans calculate who is most useful to burn and be burned, in the expectation of founding on this scorched earth a new order in its likeness. And the left in all this? Paradoxically, it shows more difficulty in understanding the changes. To the right, it's clear since June: the time of inclusive neoliberalism is gone. It has moved from conciliation to class warfare. This is the background of Lulaist agony. That Lula himself does not realize his anachronism is expected. That the PSOL is swallowed up by this self-deception, is a tragic myopia. Instead of differentiating itself from the PT by searching for something new from the left, the Boulos candidacy goes in the direction of symbiosis, in increasingly worseningconditions. Lulaism is a policy that navigates in the waters of system. At this moment, only the rise of the masses can resurrect it as a bourgeois alternative. The paradox is that this will only happen if the ties of Lulaism are broken - as in June. But when that happens, the rioters will ask: all of this effort for Lula-lá? If the snake of anti-PTism is difficult to control, street politics beyond the PT’s control will be much more difficult. That is why not even Lula is interested in people on the street. Envisioning a bridge between PTism and the left, the Boulos candidacy is constrained by the agenda of the first. In the process, he risks corroborating the kidnapping of the left in the magic lamp of Lulaism. In addition to its internal contradictions, this policy has lost its bearings in history: therefore it will not be repeated, except as a farce. Lulaism is not the antidote to fascism, but a drug that hinders the understanding of what is happening. Only through struggle will we escape barbarism, not with morphine. 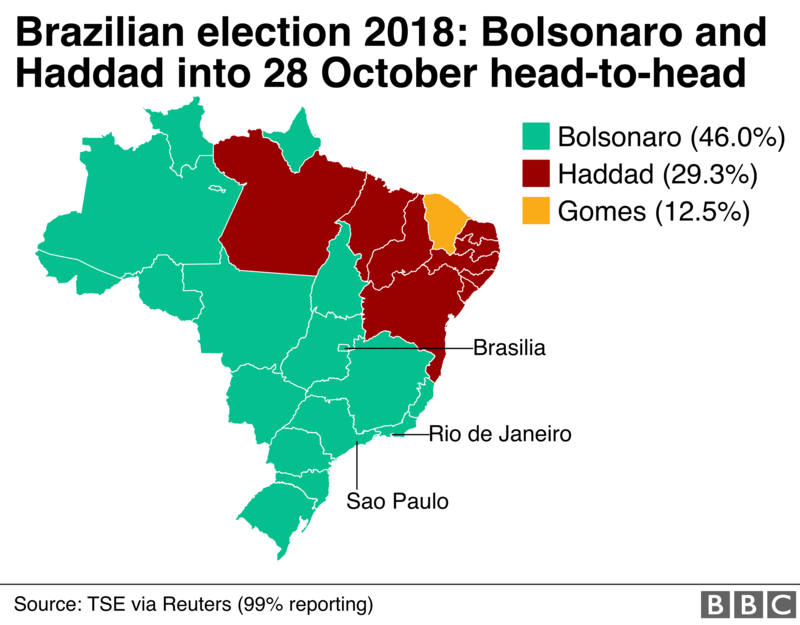 Regardless of the outcome, the winner of this election is already Bolsonaro. Because it was he who set the debate. The axis of debate shifted to the right, further distancing debate over structural issues. On the other hand, the left already lost this dispute, because it didn’t even enter the game. To go back to the first division of politics, they will need to update diagnosis and strategy. In the meantime, we will see defeats accumulate, without even disputing the course of history. The New Republic is the period after the dictatorship and has the 1988 Constitution as a reference point. Former mayor of Sao Paulo, the largest city in the country, Fernando Haddad is the PT candidate since the candidacy of Lula was denied. Geraldo Alckmin is the candidate of the PSDB (known as "Tucanos"), a party that polarized the last five Brazilian presidential elections with the PT. Henrique Meirelles is a candidate for the MDB, Michel Temer's party. He was a member of Congress for the PSDB, president of the Central Bank under Lula (2003-2010) and Minister of Finance for Temer (2016-2018). João Amoedo is an entrepreneur, one of the founders of the New Party that will be discussed later. DEM, or Democrats, is the name adopted by the former PFL, a party that congregates heirs of the dictatorship. Television communicator and entrepreneur, João Dória made his debut in politics in 2016, electing himself mayor of São Paulo in an election in which he defeated three former PT mayors in the first round. Dória is a candidate for governor of the state of São Paulo for the PSDB (Toucans). In the 1989 elections, there were 22 candidates, five of whom were considered competitive. Fernando Collor beat Lula by a small margin in the second round. Candidate of the PDT, Ciro Gomes has been a member of the PDS, PSDB and PPS political parties, among others. He was a minister in the Itamar Franco government as well as in Lula’s administration. Gomes and the PT flirted with forming an alliance, but the candidate chose to distance himself from this legend, which he has criticized in his campaign. A movement against the election of Bolsonaro led by women who carried out massive protests on September 29th. First president elected by popular vote after the dictatorship, Fernando Collor was overthrown in an impeachment process in 1992. This self-critique was made by Tasso Jereissati, a national leader in the PT, in a recent interview. The Socialism and Liberty Party, founded in 2004 by parliamentarians kicked out of the PT, critical of paths taken by the federal government. It is the most relevant party to the left of the PT. Of bourgeois origin, Guilherme Boulos is the main leader of the MTST (Movement of Homeless Workers), an important popular movement in the country. Boulos joined the party in the last hour and the internal process that culminated in his nomination as a candidate was widely criticized.